Milbank 1-Position Horn bypass ringless meter socket is rated at 200-Amps and 600-Volt AC. Surface mountable meter socket has G90 galvanized steel enclosure with powder-coated finish. It has four terminal jaws. 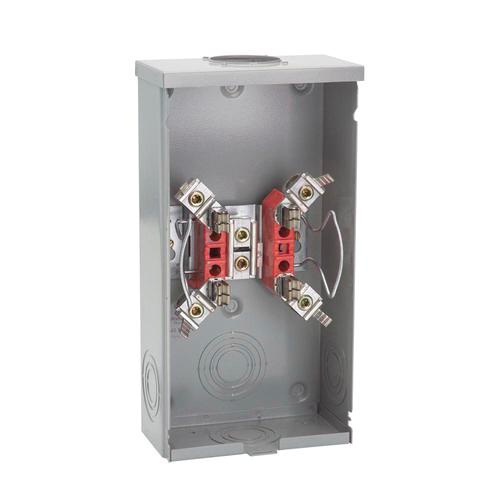 This 1-Phase meter socket with overhead cable entry, has single lay-in line side and load side terminal connections. It accommodates wire of size 6-AWG - 350-KCMIL at line side/load side. Socket measures 15-1/2-Inch x 8-Inch x 4-1/8-Inch. It has one 2-1/2-Inch, two 2-1/2-Inch, three 2-1/2-Inch, four 2-1/2-Inch, five 1/4-Inch, five 1/2-Inch and six 1/4-Inch concentric knockouts. Meter socket is UL listed.